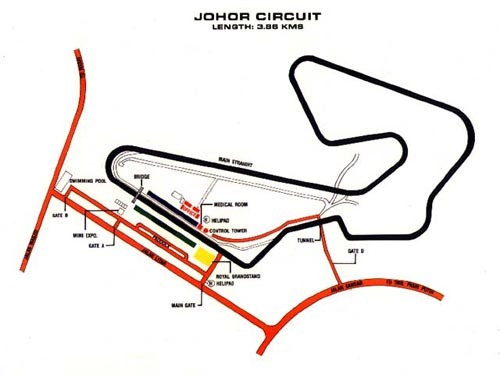 Built in 1986, the Johor Circuit is the first international class motor racing circuit outside of the Klang Valley. It initially catered to the growing local enthusiasts but soon gained recognition not only regionally, but also internationally. Although it was then a comparatively new circuit, its challenging 3.86km configuration soon attained respect and admiration amongst the racing fraternity. In 1990, just four years after it was built, the circuit was upgraded to the strict FIM World GP homologation requirements. In 1998, it hosted the World Motorcycle Grand Prix Championship. Ever since then, it has been hosting regular local and regional events. Johor Circuit is one of the best suited circuit based venues in the country for Motor Manufacturer launch days. Our facilities make it an ideal place for related distributors, resellers and even retailers and important customers of cars or bikes to witness the launch of new vehicles with fanfare. One of the better ways to foster close employees’ sense of togetherness is to hold corporate family days. At Johor Circuit, we can arrange activities and events to make it an outing which is different from others. With catering facilities and event creation know-how, a family day at the track can be filled with excitement and fun for all. Situated within short driving distance to the major domestic pan-country highways and exit points to neighbouring Singapore, the Johor Circuit is also easily accessed by the Senai Airport. This fact has played a major role in making Pasir Gudang a growing tourist destination as well as a commercial hub. There are many magnificent international class golf resorts within easy reach and just as easily accessible are a marina area for water sports as well as nature tour destinations. Johor Circuit recognises the thrills and attraction that a well-organised series of speed and racing events can appeal to a big group of enthusiasts, either as participants or as mere spectators. It is a one-stop centre of excellence for Malaysian motorsports development. It promotes the thrills and attraction that a well-organised series of speed and racing events can bring with its international-class infrastructure. In recent years, motor racing in virtually all categories has become a fast emerging favourite sporting activity, not only in Malaysia but also globally. From street motorcycle racing to go-kart racing to Formula 1, the enthusiasm for speed outpaces the number and magnitude of events that can be organised professionally in the domestic scene. It is still true that motor racing has its dangers, but with professional organisation and specifically designated circuits, these are drastically minimised. As a sports resort, we will be offering not only the premise for the event, but also the amenities to cater for the needs of an outing or holiday need for the crowd and participants. It offers the amenities and expertise from learning the basics of racing right up to hosting world-class events. We believe that racing can and SHOULD be an affordable family / social affair too. The resort concept particularly emphasises the point that events at the Johor Circuit would not only be sports in nature, but includes the more social aspects of each event. Johor Circuit has become the de facto place for Singaporeans to display their speed skills and speed machines. This has been shown by the immensely popular Weekend Sprints. The MotorSports Resort concept is the showcase for these enthusiasts to have fun and socialise. Check us out for new and even extreme style events that will guarantee your pulses to race. Minimum safety requirements for track hirer to practice on the track. 1. Leather jacket or touring jacket with shoulder and elbow guard. 5. Full face approved helmet. Minimum safety requirement for track hirer to practice on the track. 1. Approved crash helmet is compulsory. 2. Wearing of shorts during practice is not allowed. 3. It is compulsory for track hirers to wear shoes during practice session. * Passengers are required to sign indemnity and must wear helmet. * Passengers are allowed only for 3 laps. * Children aged 17 and below are not allowed to be a passenger. 1. Track hirers must register, make payment and sign indemnity at circuit Administration Office. 3. Pit exit marshal will check receipt and eligibility of track hirer. 4. Upon approval, proceed to enter track after Turn 1. 5. To come back to pit area, take the slip road before the last corner. 6. Changing of rider / driver is strictly PROHIBITED. 7. You are not allowed to stop your vehicle at any point in the track unless your vehicle breaks down. Red – Slow down completely and ride/drive slowly to pit. Practice stops temporarily. Chequered – End of session – go for last lap and back to pit. 9. No testing is allowed around pit area and service roads. 10. All service roads are PROHIBITED area. Johor Circuit is very popular as a venue for riding clubs and car track day events. So if you want to experience the thrills of driving your own car or riding your own motorcycle through the sweeps of the circuit then we operate various days to enable you to enjoy “the other side of the fence”. PreviousRON95 or RON97? Is there a difference?